Leftist billionaire George Soros’s Open Society Foundations announced on Nov. 26 that it would cease operations in Turkey. The foundation said “baseless claims” in the media “made it impossible” for it to carry out its work in Turkey. Last week, Turkish President Recep Tayyip Erdogan slammed Soros for allegedly supporting Osman Kavala, a former business tycoon who is in prison awaiting trial on charges of inciting the 2013 Gezi Park riots which over the course of a few days resulted in 20 deaths, the torching of cars and destruction of public property. “The person (Kavala), who financed terrorists during the Gezi incidents, is currently in prison. And who is behind him? The famous Hungarian Jew George Soros. This is a man who was assigned to divide nations and shatter them. He has so much money and he is spending it in these ways,” Erdogan said. Over a dozen people linked to Kavala, including Open Society Foundations Chairman Ali Hakan Altınay, were detained on Nov. 16 on charges of trying to spread the 2013 riots and “creating chaos with the ultimate intent to overthrow the government,” according to a report by the Daily Sabah. 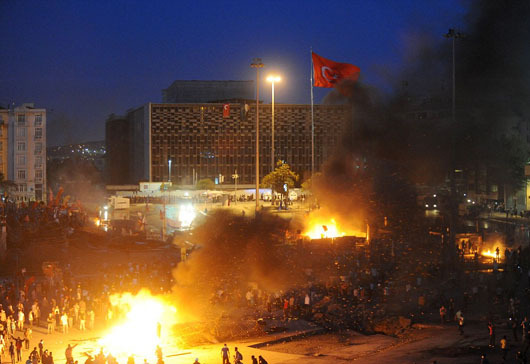 Turkish National Police issued a statement at the time of the arrests saying Kavala sought to overthrow the government by force through the Gezi Park riots and used the Open Society and Anadolu Kultur to finance and organize the riots. The Open Society Foundations was founded by Soros in 1979. The grant-making network operates in more than 100 countries, with 26 national and regional offices, and lists annual expenditures exceeding $940 million.